Team DDG is honored again…this time with the coveted PromaxBDA Gold Award for Scenic Design! Just recently, Devlin Design Group won its third consecutive annual award for Set of the Year from NewscastStudio for its work with KTVA-TV, where Team DDG reinvented an entire television station in Anchorage, Alaska. Now, Team DDG wins the prestigious PromaxBDA Gold Award for its groundbreaking scenic design for KSAZ-TV in Phoenix. What the judges saw was Team DDG’s fearless departure from the ordinary, and their courage to create something entirely new. Team DDG’s goal was to establish points of difference between KSAZ-TV and their competition in a market where TV News has become a commodity, and everyone’s methods of presentation look alike. The result is a daring and innovative storytelling environment that redefines how news sets will be designed going forward. In addition to Team DDG’s design, this news presentation area offers limitless storytelling venues provided by large color-changing backlit walls that can be programmed to change the style and mood of each newscast. 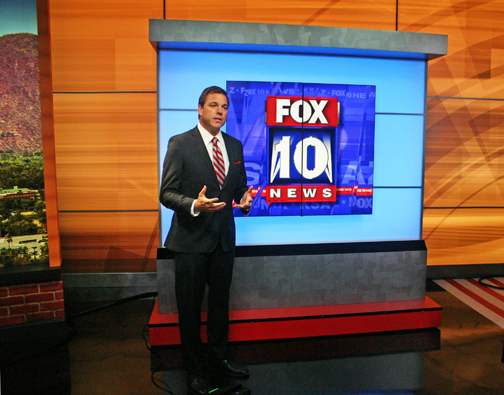 This versatile presentation area has become an integral part of KSAZ-TV’s storytelling strategy. 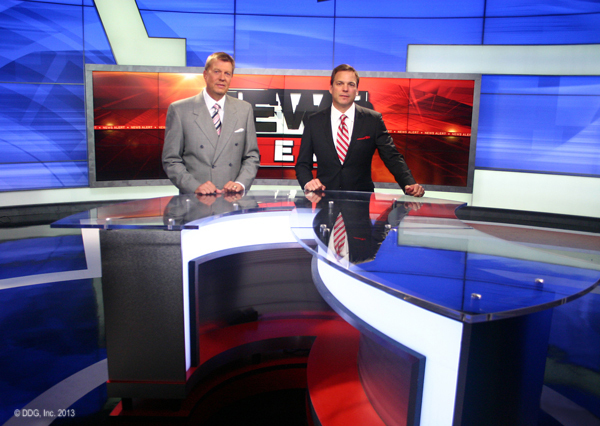 Not only does this set engage Phoenix viewers, it also energizes news talent and challenges producers to elevate their storytelling. A key part of KSAZ-TV’s daily planning process is a choreography session meant to challenge the unlimited opportunities presented by this gorgeous HD set. This innovative storytelling environment also incorporates two mobile video kiosks. One has two vertical monitors, the second kiosk includes a 65-inch, mobile touch screen used for interactive breaking news, weather, sports and social media stories. There are a number of things that set Devlin Design Group apart from all the others in the world of scenic design. The first is one-on-one contact with Team DDG designers. You’ll always speak directly to one of Team DDG’s designers who will listen to your vision and then transform it into stunning reality! Devlin Design Group is an advertiser on NewscastStudio and contributed to the content of this post.